If you're looking for a vehicle that is both versatile and affordable, but you don't want to look like you're driving a car whose only attribute is that it's versatile and affordable, the 2011 Kia Soul is the car for you. It's much bigger on the inside than it looks! It's very comfortable and a relatively smooth ride, considering its price point and size. I love how much space there is in my Kia Soul. Many people are surprised at how large it is inside. This is very helpful when driving for Uber and Lyft. Also very spacious with the seats down. I can fit a lot more as we are in process of moving than my wife can in her Chevy Trax. It's also very useful that the seats go down in 2 parts, one smaller than the other. I was able to fit 2 riders and a lot of luggage once, so being able to put down the large part was helpful, while still leaving the smaller portion up for a passenger. The only thing I don't like about it is the way it handles in snow and ice. I would say my Chevy Cavalier handled much better in snow and ice, even several inches of snow, than the Soul. My wife would like it and even buy one for herself if it had lumbar support. I prefer the straight seat all the way up because I am short (5-1) and those curved seats are designed for people at least 5-5, if not taller. It gets great mileage. Having driven a family member's Kia Soul greatly influenced my decision to buy one for myself. The Kia Soul is compact and easy to maneuver with parking in small spaces being a breeze but the interior is well designed to be roomy and comfortable for both driver and passengers. There is ample storage in the back with easy access with a rear hatchback door. The back seats fold easily and quickly to offer even greater room for transporting large items. I'm very pleased with the mpg and even opted for a five speed transmission to ensure that I get the best possible gas mileage. My car is stylish, dependable, economic and perfect for city living. The best car to go around town. 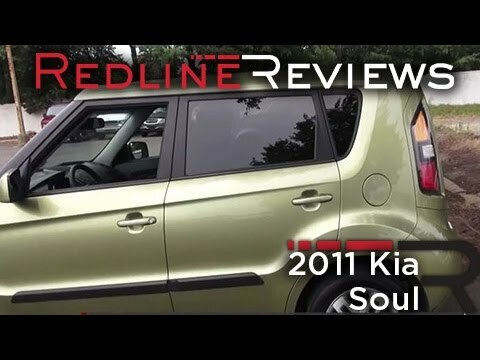 The Kia Soul is truly an amazing car. Even in the older models, you have the advantage of a small car that can fit anywhere, without suffering from a small, cramped interior. It is easy to clean, and can even transport a large dog if you are creative. The gas mileage is good, especially if your vehicle is primarily used to travel around town. However, the car is a little uneasy at speeds upwards of 65mph. It fairs fine without horrible issues, but it certainly does not have an easy time reaching those speeds. The seats afford the driver and passages a comfortable posture, and the car is incredible comfortable.